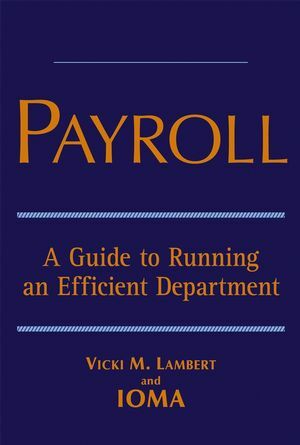 Vicki M. Lambert, CPP (certified payroll professional), is a respected consultant, lecturer, and author of many books and articles. She lectures extensively throughout the United States on payroll administration and compliance issues for clients that have included Automatic Data Processing, CCH Incorporated, Ceridian Employer Services, and The Employer Group. She conceived of, created the teaching materials, and coordinated the program for the certificate in Payroll Practice and Management offered at several universities nationwide. Lambert has been a guest lecturer at the American Payroll Association Annual Symposium and the American Society for Payroll Management Forum and Trade Show, among others. She has written articles for the Payroll Practitioner’s Monthly State Tax Alert (IOMA), The Payroll Advisor (Aspen), California Payroll Compliance Report (ProPub) and Wage-Hour Compliance Report (ProPub), and she is a monthly contributing editor for the Payroll Practitioner’s Monthly (IOMA). IOMA, New York, NY, The Institute of Management and Administration, offers high quality information products for business professionals. It provides benchmarking data, advisory services, custom content, expert analysis, management training, newsletters, audioconferences, and many newsletters, special reports and other services to offer the best "in-the-trenches" management advice available. Chapter 1. Basic Functions of the Payroll Department. 5. Payroll Reconciliation, Tax Deposits and Quarterly Reporting. Chapter 2. Staffing the Payroll Department. 2.1Creating a First Rate Payroll Department. 2.3 Staff Motivation and Morale. 2.4 Working with Human Resources and other Departments. 3.3 Dealing with the Internal Revenue Service. 3.4 Handling Department of Labor Audits. Chapter 4. Benefits and the Payroll Department. 4.1 Should Payroll Handle the Company’s Benefits? 4.2 Year End and Year Beginning Issues. 5.1 Objectives of a Computerized Payroll System. 5.3 Selecting a Computerize Payroll System. 5.4 Controls and Security for the Payroll System. 5.5 Disaster Recover a Must. 5.6 Time and Attendance Systems. 5.7 Employee Self Service Systems. 6.1 Paper Checks are Still an Option. 7.1 Start Year End Off With a Memo. 7.2 Planning and Surviving Year End. 7.4 Reconciliation of Payroll at Year End. Chapter 8. Payroll and the New Year. 8.1 Setting Up the Payroll System for the New Year. 8.2 Setting Up the Payroll Department for the New Year. Chapter 9. Professionalism and the Payroll Department. 9.1 What is a CPP? 9.2 Why Become a CPP. 9.3 Studying for the test.